In order to respond to new educational needs and provide even better training, Scuola Europa offers a highly qualifying course of study with technical and practical characteristics. In addition to achieving common learning outcomes at ministerial high schools, the High School of Applied Sciences of Scuola Europa allows students to acquire skills thanks to intensive laboratory work and critical analysis of the phenomena considered. The results of these activities are in fact amplified by the use of the state-of-the-art scientific and computer lab that students live on a daily basis. The course of studies while respecting the traditional humanistic and scientific programs involves the enhancement of the natural sciences, mathematics, computer science and the English language and inserts subjects of an economic nature, not envisaging the study of Latin. 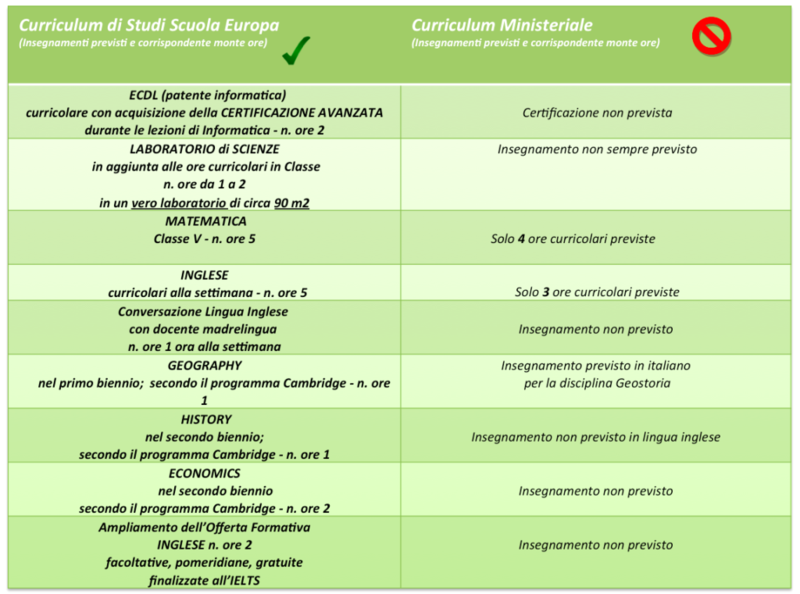 Like all the other orders of Scuola Europa, this high school is a recognized Cambridge International School and is then able to insert, within the traditional course of study, the teachings that follow the programs of the English school and allow their students to pay for their examinations at the end of courses of study.